Unique rainfed commercial rice farming methods practiced in PNG have drawn the attention of prestigious Charles Sturt University in Australia. Students and staff from the New South Wales-based institution were in Papua New Guinea as part of their international field excursion to learn from different agri-based based industries, and in particular the grain-based agriculture production systems in the Markham Valley. The Markham Valley is seeing a rapid change in the landscape with a recent drive by number of large agri-based companies including Trukai Industries who have put significant investment into creating a grain-based farming hub. A rapid evolution from being just a cattle country to grain production is now very visible to those who have lived in or commuted frequently along one of PNG’s biggest highways, which connects major province centres in the highlands and Madang province. “The Government and the people of Papua New Guinea are now fully aware of the great potential for agriculture the valley,” said Trukai Industries Rice Development Manager Humphrey Saese. The students were led by Lecturer in Agricultural Business Management Katrina Durham who has visited various agro-based industries in the Valley. 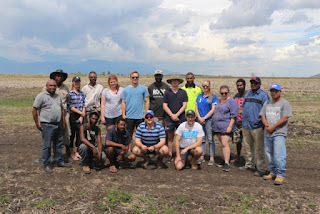 The students spent three days of their visit at Markham Valley in the Morobe province, where Trukai and landowners are pioneering in new and unique model of commercial rice farming through their joint-venture. The students we able to learn how the company has made significant progress in testing the model, which includes engaging local farmers, developing a market structure and supporting farmers with the appropriate rice farming technology. The visited extended to the Trukai milling facilities in Lae where the raw materials from the rainfed crop will be processed and packaged as part of the PNG-grown rice brands that Trukai Industries is working towards.